Stanbrook Abbey in Worcestershire is beautiful wedding venue. Now a hotel as well as a wedding venue, there's no shortage of locations for a bridal party to get ready. To start with, there's Bride's Manor, a huge house that's attached to the venue though a 60 metre corridor which leads directly into the Callow Hall. The manor itself has many bedrooms, a lounge, kitchen and dining room and several dressing rooms and bathrooms. Being a hotel, there are hundreds of rooms to choose from too - but Louise opted for something entirely different and got ready with her bridesmaids in the Board Room. Usually set aside for meetings of business people, the Board Room is no less ornately decorated than any other room in the abbey. The tiled floor and furnishings echo the rest of the venue, and looking at it from an outside perspective, apart from a large central table, there's nothing to set the room apart from any other bridal preparation room at any other wedding venue. After I'd been to photograph Louise's soon-to-be husband, Matt, I returned to the Board Room to continue my documentary coverage of the bride having her hair and makeup done. Earlier that morning I had been photographing the bride's wedding dress, hanging from a chandelier. 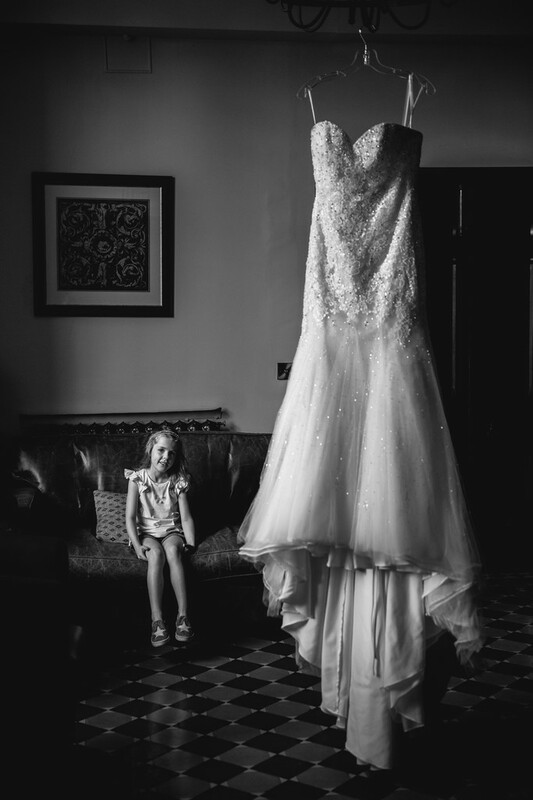 When I returned to the room, the flower-girl was sitting by the wedding dress. making sure it came to no harm. I lined up my camera and grabbed a few frames before she noticed me. The light for this image is provided by a large window that's to the left of the frame, that provides wonderful directional lighting for both the girl and the dress.